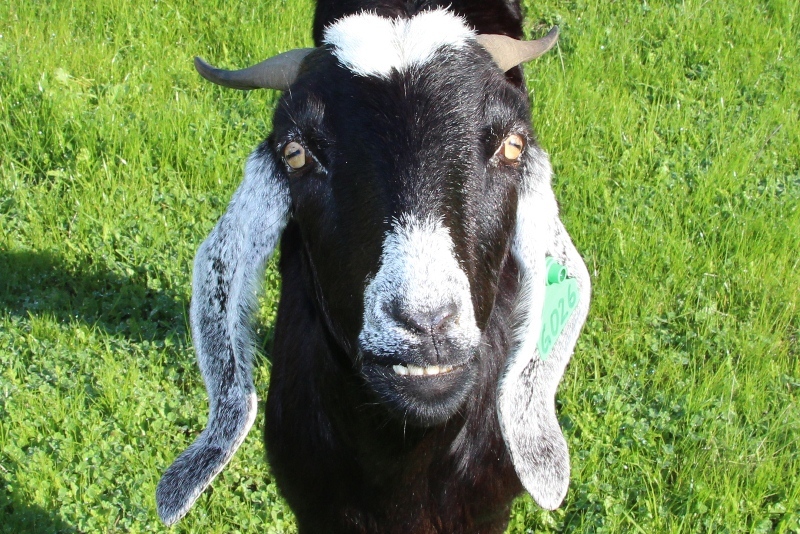 Our Nubian/Boer goat Midge has a slightly overshot bottom jaw which gives her a bit of a monkey face. You can’t see her teeth when she is relaxed, but when she is alert and sniffing you can. She will be two years old in July and has 4 permanent teeth and 4 baby teeth. Goats only have teeth on the bottom jaw which meet a Dental Pad on the upper. We will have to monitor her to make sure she maintains a correct bite as more teeth develop, as they could wear abnormally and limit her browsing ability. I have already noticed that she quite often grips and rips the onion weed with her molars, so she may already not have the cutting power that she should, but she does use her incisors for pulling the leaves off the Emu Bush. This is quite a common feature in the Roman nosed Nubians, but in her case it is not severe enough to be classed a defect. Her offspring are unlikely to have this as the sire is a Saanen which will mitigate this trait.